Learn how the BlackBerry Partners Fund created a publicly accessible website to promote the fund to applicants around the world and a private online community for the investment committee to vet potential partner fund submissions. This case study describes how the fund committee members securely store, manage and retrieve materials and collaborate during the due diligence process, while portions of the community remain open for public access. 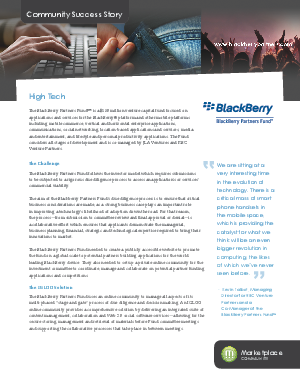 The case study also describes how the Blackberry Partners Fund adheres to stringent regulatory guidelines using detailed audit trails and version control wrapped in a secure, cloud-based computing environment.